If 2016 marked Gosha Rubchinskiy’s Russian homecoming, then 2018 proved how many Western labels were willing to follow him there. The event showcased the army of Western brands already queuing up for a dose of Rubchinskiy’s post-Soviet edge. As well as Rubchinskiy’s continuing collaboration with Adidas, the designer also unveiled work with Doc Martins, Levi’s and Burberry, drawing heavily on the brand’s iconic check. The show at the Yeltsin Centre in Yekaterinburg marked the latest stop on Rubchinskiy’s homecoming tour, following events in Kaliningrad and St Petersburg. Sportswear remained a central feature in the collection, with plenty of oversized sweatshirts and trackpants alongside more tailored pieces. Many designs also showed a heavy military influence, accentuated by a central piece of artwork by Moscow-born artist Erik Bulatov. 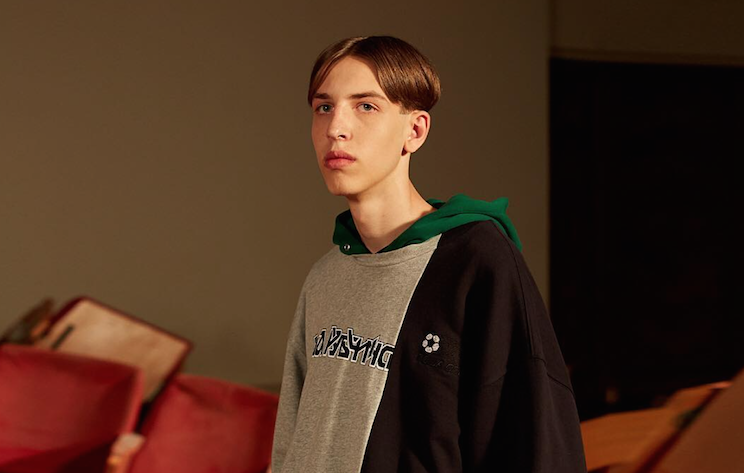 His piece crowned the catwalk with the word “freedom”, while Rubchinskiy’s models below paraded sweatshirts bearing the word “enemy”. The models descended into the museum as they stepped over the catwalk, feeding into a jostling frenzy that had reached almost mosh pit proportions by the show’s end. The finale itself saw the models belt out Soviet rock classic “Goodbye America” in the style of a impecibly dressed (if inescabably awkward) school choir.